It has been an insanely busy and sad two months here. We have had to say goodbye to Augusta, whose leg would not heal and whose other leg was not strong enough to support her. We have gone to Midwest City to Dr. Dustin Brown for plating surgeries on Janie and Bella’s broken legs. We got four more mill dogs in: Angus, Winnie, Simone and Iris. Angus passed away during his neuter, and the three girls have gone to amazing foster homes. And just a couple of days ago, we answered a call for help for a mill mama and her one baby. Not sure if she just had one, or if baby Joy is the only survivor. They were both skinny, and are eating as fast as we can feed them! In addition, we are fundraising with a Scentsy and Velata fundraiser, trying to pay off the mountain of new and old vet bills! Join us! And happy holidays from all of us. Maggie Lenertz has been working in rescue with Italian Greyhounds for 10 years. Three years ago, Maggie married Jim. Together they have built Hazeljane's Blessings into a 501 (c) 3 non-profit charity in Tulsa, Oklahoma. 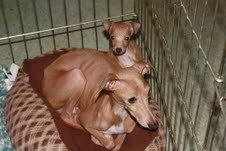 At any given time, we have between 7-12 foster Italian Greyhounds in our home, along with our own 4 babies. In addition, we both work full time. Maggie's hobbies (apart from iggies) are quilting and reading. She frequently makes quilts to raffle to support the rescue! Thanks to the online pet pharmacy, 1-800-PetMeds, for their product donation! Designed by Vela Themes. All Rights Reserved.